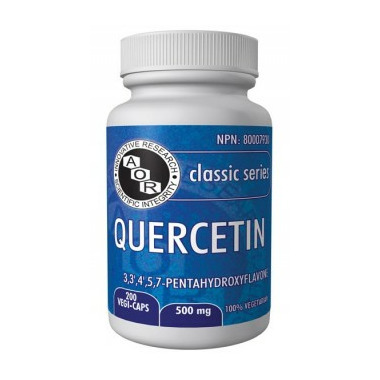 AOR Quercetin is the flavone aglycone (non-sugar-bound) form of the polyphenolic flavonoid rutin. Quercetin is the major bioflavonoid in the human diet and an antioxidant for the maintenance of good health. Adult Dosage: Take 1 capsule three times daily with food, or as directed by a qualified health care practitioner. Cautions: Consult a health care practitioner for use beyond 12 weeks. AOR Guarantees: that no ingredients not listed on the label have been added to the product. Contains no citrus, wheat, gluten, corn, nuts, peanuts, sesame seeds, sulphites, mustard, dairy, soy, eggs, fish, shellfish or any animal byproducts.